The large lock is undergoing its annual inspection and maintenance which should conclude by November 20. This is also referred to as the Corps' Annual Cell Phone Scavenger Hunt due to the number of phones recovered when the lock is drained. Numerous other types of objects are also found but cell phones are among the most common. 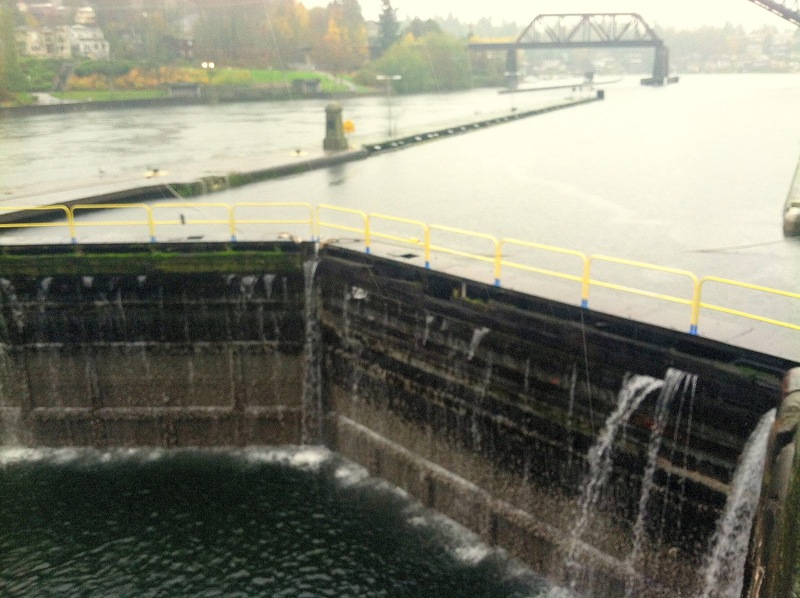 As the water is drained out, fish and other marine life have to be carefully moved to exit the lock before it completely emptied. This year found the usual assortment of fish, starfish, seals, otters, and an octopus. All removed safely to the sound so the work could begin. The locks are each drained once a year to inspect all critical components and perform some maintenance necessary for the fish migration which is a crucial part of the Locks mission. To begin the process, emergency gates are lowered in sections by crane inside the east gates. Once these are solidly in place a scaffold will be assembled on the lock wall and then lowered by crane to rest on the lock floor. While the crane is still providing support for the scaffold, two personnel climb down the scaffold to secure the locking mechanism at the bottom of the legs. These individuals are called the “Short Straw” men. The scaffolding now secured below, the crane releases its hold and the scaffold will then be securely fastened against the lock wall for the rest of the crew to descend to perform their daily tasks. All working components of the lock will be inspected and if necessary, repaired. For the most part, it's routine maintenance which is required. The locks were originally finished in 1916 and the aging process means attention to detail is critical. Over the years improvements were made, new technology replacing old technology, but by and large it is looks substantially the same today as it did when completed. Most of the visible changes have been made for safety reasons, hand and guard rails, lighting, etc., and the mechanical upgrades are largely well out of sight of the visitors. The culverts, through which the water moves from lakeside to sound, become encrusted with barnacles just as the lock walls do. Because many of the salmon will use them for their migration crews will spend days scraping the barnacles from the culvert walls to prevent harm to the salmon as they brush against the side. Some estimate that as much as 47% of the salmon will use the locks instead of the fish ladder to reach their spawning grounds but it is widely believed this number to be highly inflated. It is probably boaters leaning over the sides of the boats while locking through that deposits most of the cell phones, with the rest simply being dropped by visitors on foot while taking pics or videos. But if you can hang onto your smart phones you can get some great shots of salmon leaping and the occasional seal among the boats during the height of the salmon season. There was once a minke whale who ventured in, but that's a story for another day. The inspection should be finished by around November 20. 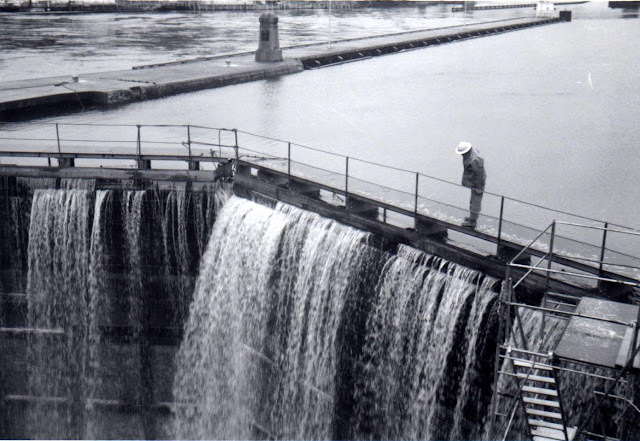 While the large lock is under maintenance, the smaller lock is still operational so visitors can still enjoy watching the process. The large lock will provide only a few glimpses of the work underway but you can always watch the birds fighting over barnacle meat and wrigglers they are feeding upon. Here are some pics of the maintenance in progress. You can click on any to see an enlarged view. Small bulldozer lowered into lock to scoop mud and debris and scrape barnacles from walls. An idea of the scale of the lock. The next two photos were taken Nov. 20 by Corps employee Katie Mcgillvray at high tide. With all the rain we received it contributed to the 12' tide level and you can see the water seeping through the outer lock wall. 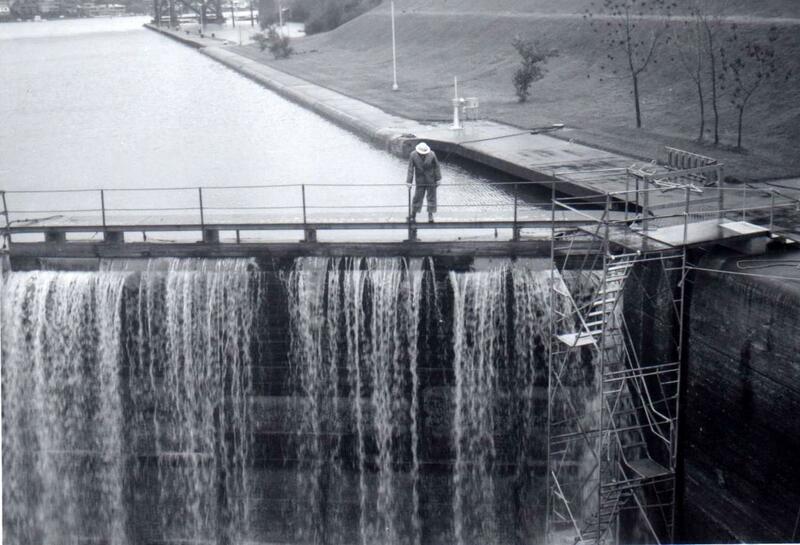 The work has been finished and the large lock is back in operation. For those who did not see the locks during this maintenance period you can mark your calendars for next November and see the lock as you rarely can. The two pictures below are of some interest as well. Notice the water spilling over the gates and into the emptied lock and the scaffolding showing in the right lower corner. We are still attempting to gather more information on when exactly this might have been taken. A search through old issues of the Seattle Times turned up a reference to water spilling over the gates during a storm on Jan. 27, 1983. The large lock is usually drained in November however so this raised a few questions. Was the lock being inspected at a different time of year or was there another reason to empty and inspect it so soon after the November event? The same article mentioned that the tide was measured at 14.8 ft which tied a record previously set in 1977. These were the two largest high tides recorded since 1898. 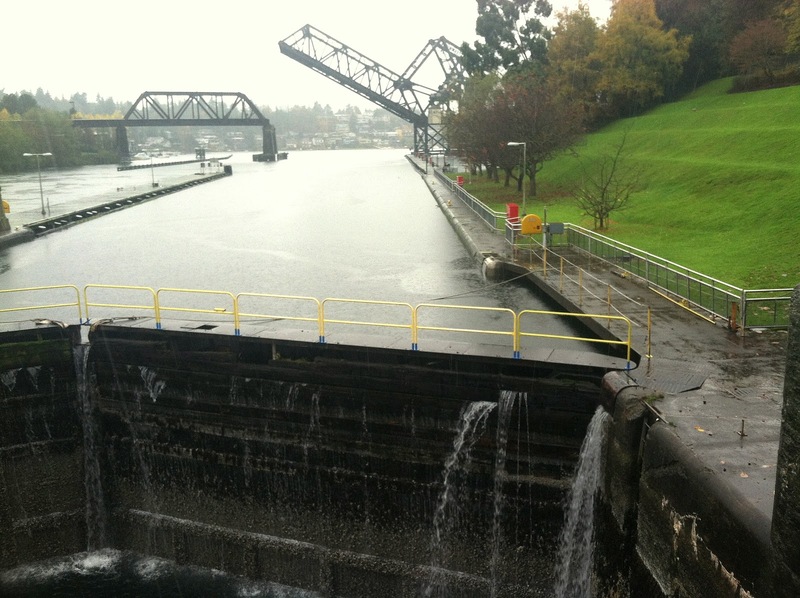 It might be worth noting the high tides in the upcoming months and making a trip to the locks. You never know but you just might see a scene like these below. Below is a link to a past inspection. Enjoy. Here is a link to the U.S. Army Corps of Engineers Chittenden locks Facebook page. You can find more photos and info on other goings on at the locks. The two bottom photos are supplied by the U.S. Army Corps of Engineers.